You've found the “U.S. 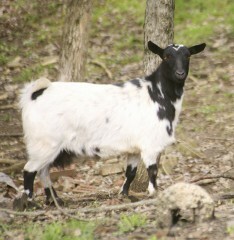 Fainting (Myotonic) Goat Breeders” page here at Hobby Farm Wisdom! If this is the first time you have visited our site: Welcome! Fainting goats are a rare breed of goat that while classified as a meat goat, is rarely used for meat production. Instead, these goats are known for possessing a congenital medical condition called myotonia congenital, which essentially means the animals muscles tense up when frightened and don’t relax immediately. While painless, it usually causes the goat to fall down on its side. The severity of the condition varies and these goats tend to control it better with age. Fainting goats also have the distinctive characteristic of having prominently set eyes that protrude from the eye socket. Fainting goats are smaller than standard breeds and are typically kept as pets or show goats. They have a friendly disposition and are easy to keep.